So, I saw this patient last week who was blind in his left eye. Oth­er than a con­gen­i­tal form of blind­ness in that eye, his ocu­lar and visu­al health were essen­tial­ly nor­mal. He asked me why I pre­scribed glass­es for him, and it led to a great and mean­ing­ful dis­cus­sion regard­ing eye safe­ty. First of all, I pre­scribed glass­es with poly­car­bon­ate lens­es to pro­tect his oth­er eye (the one that sees nor­mal­ly). I typ­i­cal­ly put this to patients as plain­ly as I can: “You’ve already used up your spare eye, and we have to do every­thing we can to keep your good eye healthy”. Poly­car­bon­ate lens­es are what safe­ty glass­es have for lens­es, but you don’t have to get them in a “safe­ty” frame or some big eye shield — those of you who remem­ber Horace Grant play­ing for the Bulls know what I’m talk­ing about. Actu­al­ly, a lot of near­sight­ed peo­ple you see about have poly­car­bon­ate lens­es in their every­day “dress” glass­es not for safe­ty, but because these lens­es are actu­al­ly thin­ner and lighter than many oth­er types of plas­tic lens­es. So called “rec specs” are also made of poly­car­bon­ate and should be used much more fre­quent­ly than they are. 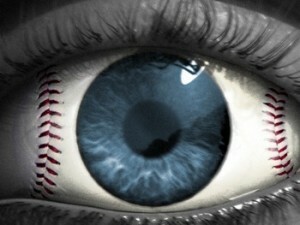 I can tell you that, first and fore­most, rac­quet­ball injuries are by far the most dam­ag­ing to the tis­sues of the eye. Base­ball injuries are a close sec­ond, and, due to the size, den­si­ty, and veloc­i­ty of a base­ball, the bones around the eye are often frac­tured, as well. Now, I’m not say­ing that it’ll tick­le if a base­ball or rac­quet­ball (or what­ev­er) hits you in your rec specs, but it might just be the dif­fer­ence between a nasty shin­er and a life-chang­ing event. So, with that in mind, “play ball”!